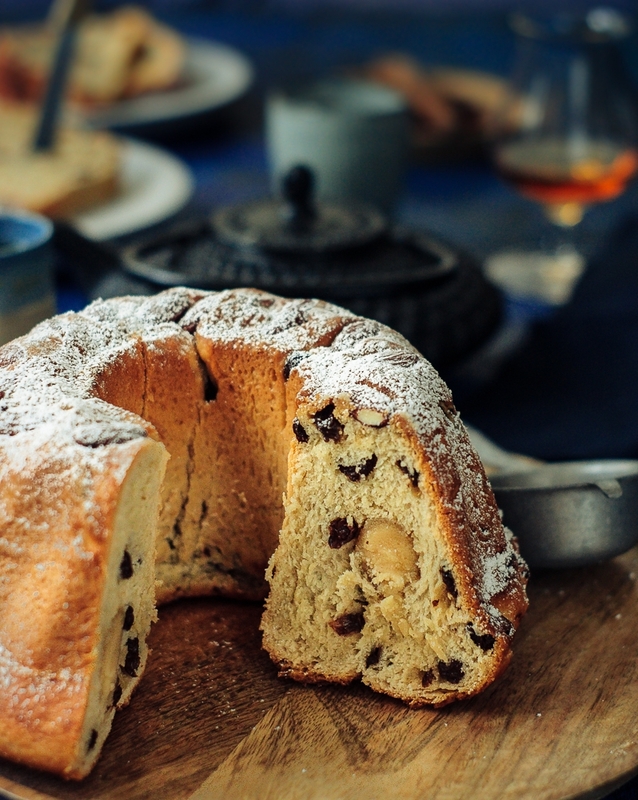 A guglhupf, also called Elsässer Guglhupf, is a yeasted cake often made with raisins. It is baked in a special guglhupf pan. The American bundt pan is very similar to the guglhupf pan and in fact another name for guglhupf is bundkuchen (bund means bundle, belt, or cord). The word guglhupf may have been derived from the Middle High German word gugel (pronunciation just like “google”) which means hood. The shape of the cake looks like a hood worn for example by the Friars Minor Capuchin. “Hupf” may have been derived from the verb lupfen meaning “to uncover or to lift something”. Therefore a gugelhupf can be translated as “lifted hood”, if you like. The word gugelhupf or guglhupf is used in Southern Germany and Austria from where it apparently came to Alsace. In Alsatian dialect the spelling changed to kuglof or kouglof. You might recognize the word kugel here, which in today’s German means ball (referring to the shape) but the word kugel for the dish is probably as well derived from gugel meaning hood. In fact the Jewish kugel is semantically related to the gugelhupf. 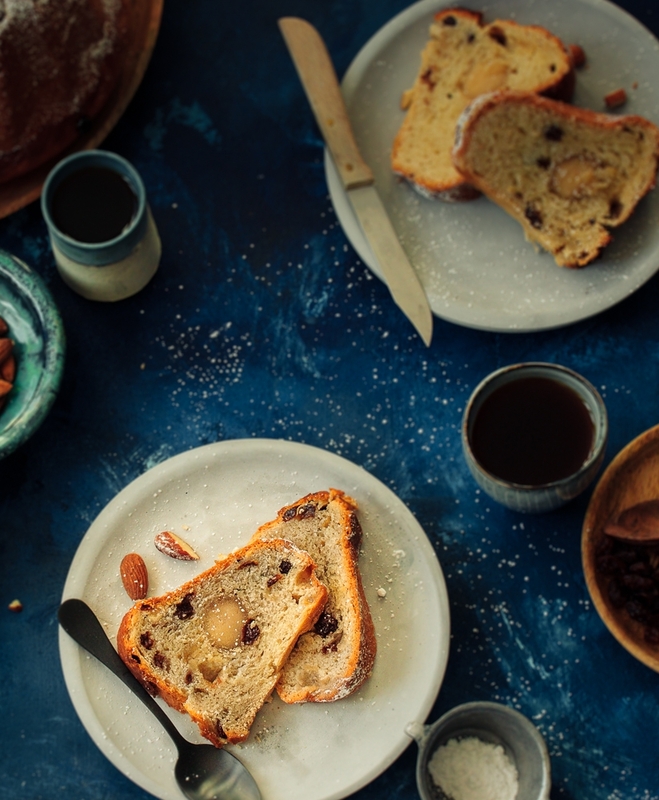 In Northern Germany we often call the guglhupf napfkuchen (Napf = bowl, pan; Kuchen = cake). Today a guglhupf doesn’t have to be yeasted anymore, the name only refers to the shape of the pan. 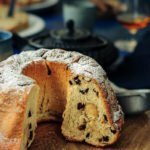 Guglhupf recipes are legion and the cake has many relatives in different countries like Poland where it is called babka. So lots of history here (couldn’t help myself) but Guglhupf is also a very delicious and simple weekday cake. If you eat cake of weekdays. (I know I do!) It’s best eaten on the day you made it, but since I added lots of raisins to this and a very unusual marzipan log, this will also be fine after a second day. (All of my coworkers will vouch for me here.) Just make sure to wrap it airtight. Oh, and if you should have any leftovers, you can make awesome French toast or fancy bread pudding with them. Please note that this recipe needs a little bit of preparation as ou have to soak the raisins on the previous evening! On the previous evening, combine raisins and whisky in a small bowl. Cover and let sit to soak. Combine milk and yeast, stir and let sit for 10 minutes. Place flour in a bowl and add milk. Also add sugar, salt, and butter. Knead the dough for 10 minutes, until it is smooth and all ingredients are incorporated properly. If you feel fancy, you can add a tablespoon of the soaking whisky to the dough as well. Cover the dough and let rest in a warm place for one hour. Meanwhile prepare a 22 inch diameter guglhupf or bundt pan by generously greasing it with vegan butter. You can also dust the pan with a thin layer of flour. This will make removing the cake a lot easier. Place the almonds on the bottom of your pan. Preheat the oven to 180°C and roll the marzipan into a log 40 cm long. Drain the raisins and knead them into the dough. Roll the dough into a rectangle that is about 40 cm long. Place the marzipan log in the middle and roll the log up. Place in the pan (seam down) and make sure the edges of the log are sealed. Cover the pan and let rest for 30 minutes. Bake for about 45 minutes or until an inserted toothpick comes out clean. Let cool completely before serving and dust with powdered sugar.